On March 5, 2019, the Board of Supervisors approved a proclamation recognizeing April 2019 as "Pennsylvania 811 Safe DIgging Month". CLICK HERE to see the Proclamation. On March 5, 2019, the Board of Supervisors approved an agreement creating a new partnership with the Hempfield RecCenter. For many years, Hempfield RecCenter, also known as HARC, has provided recreational and fitness opportunities for residents of West Hempfield Township, as well as East Hempfield Township, Mountville Borough, East Petersburg Borough, and the Hempfield School District. Coming this spring, Hempfield RecCenter will be undertaking a new role in West Hempfield Township. Hempfield RecCenter will be maintaining the Township's parks, overseeing the rental of our park pavillions and athletic fields, and providing new and exciting recreational and educational programming within our parks! 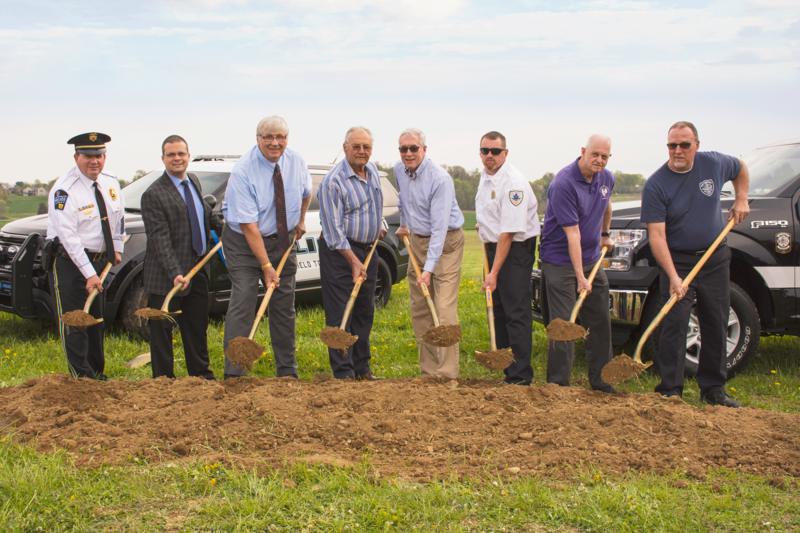 We look forward to this new partnership as we are sure it will provide new opportunities and experiences for our residents throughout our community. A RESOLUTION HONORING THE SERVICE OF MARGARET SHECKARD ON THE OCCASION OF HER RETIREMENT FROM WEST HEMPFIELD TOWNSHIP POLICE DEPARTMENT. 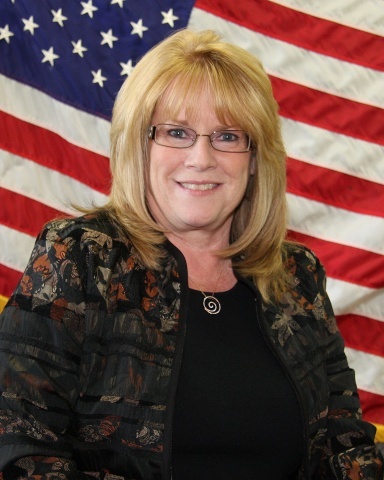 WHEREAS, Margaret Sheckard, affectionately known as “Molly” will retire from her position with West Hempfield Township Police Department as its Administrative Assistant effective January 07, 2019. BE IT FURTHER RESOLVED, that this Board of Supervisors acknowledge and applaud Molly’s service at this public meeting held on January 7, 2019, by presenting her this resolution with the grateful appreciation of the Board of Supervisors. Congratulations Molly and welcome to your new part time career! At their regularly scheduled monthly meeting, the Board of Supervisors promoted Corporal Ryan P. Draper to the rank of Sergeant. 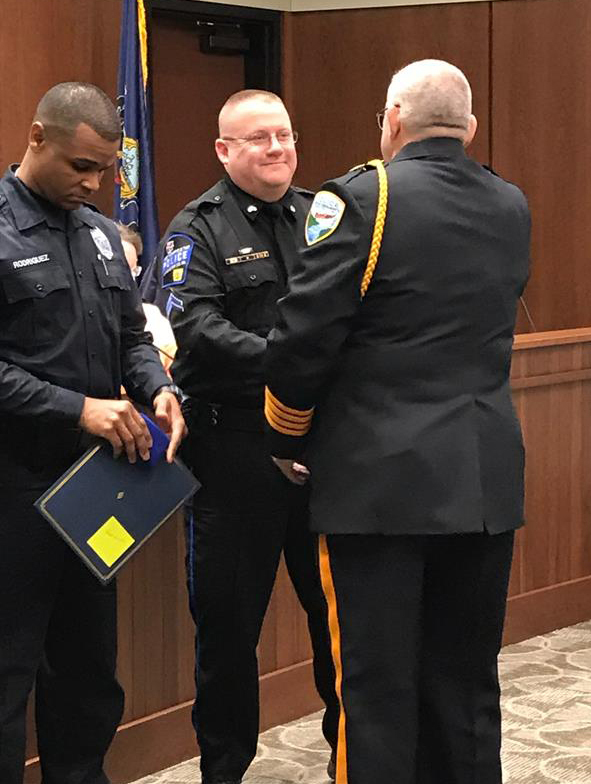 Chairman David Dumeyer stated that Draper was being for his past performance and demonstrated leadership ability as well as promoting him to the rank of Sergeant..
Corporal Draper has been a member of the West Hempfield Township Police Department since January 7, 2002 (January 7th appears to be a lucky date for Ryan). 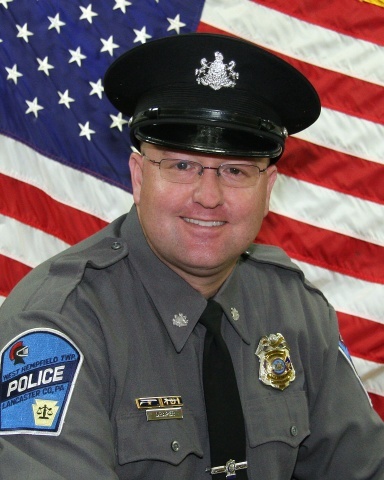 Prior to joining our department, he was an officer with the Columbia Borough Police Department for 2 years giving him over 19 years of total law enforcement experience. 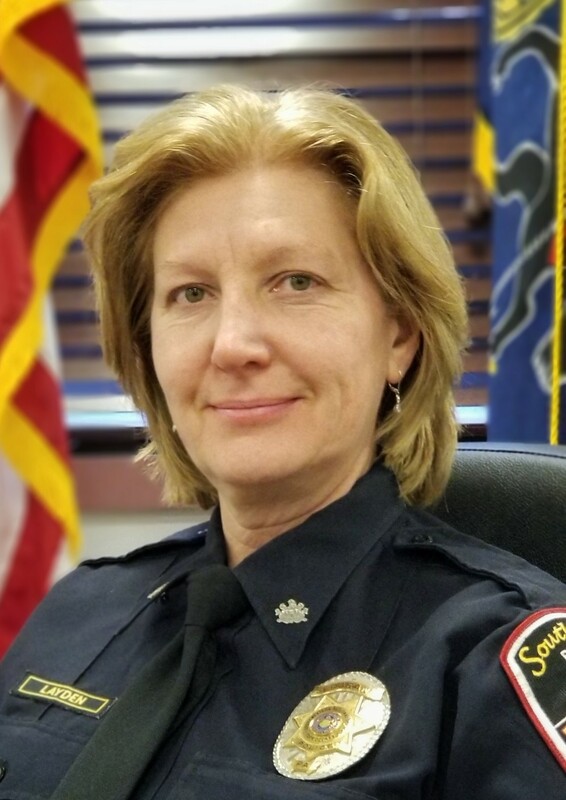 Officer Draper has served the department in many facets including a bicycle officer, accident reconstructionist, Crisis Intervention Team officer, and DATA Master coordinator to name a few. Officer Draper serves as a department instructor for computer software programs for the entering and issuing of traffic citations and completing accident reports online. Additionally, for the past several years he has been assisting in teaching new accident reconstructionist formal classroom material and is a certified Project Lifesaver instructor as well as a Field Training Officer for newly hired police officers. In 2015, he was named as a platoon designated Officer in Charge and in 2016; he was promoted to the rank of Corporal and assigned to the Patrol Division as a shift supervisor. Corporal Draper has received numerous commendations and awards during his 17 years of service to the citizens of West Hempfield Township. Sergeant Draper chose to have his wife, Erika, pin on his new badge. Sergeant Draper will remain assigned to the Patrol Division as a platoon supervisor. Hempfield recCenter, 950 Church Street in Landisville, is grateful for the personal sacrifices made by members of our active military. As a thank you for their selfless dedication, the nonprofit organization invites active duty military personnel home on leave to use the facility free for 30 days. The one-month-long membership, provides Marines, soldiers, airmen and sailors full access to its fitness center, indoor and outdoor pools, group exercise classes and full-court basketball gym. It is Hempfield recCenter’s way of saying thank you to our men and women in uniform. For more information about this free community service, contact the membership office at 717-898-3102 ext. 41 or stop by the facility to signed up. In its commitment to promote fitness and wellness within the community, Hempfield recCenter, 950 Church Street in Landisville, is happy to announce a series of new outdoor programs aimed at providing free fitness opportunities and family events in two area parks. Beginning Saturday, June 2 at 8:00 am and continuing on July 7 and August 4, Amos Herr Park in East Hempfield Township will be the setting for free, No Equipment Needed exercise classes. Each 45-minute class will include basic moves that beginning to advanced exercisers will enjoy along with body weight exercises to work all major muscles groups. Following the No Equipment Needed class, at 8:45 am certified instructors will lead a free Yoga in the Park class. Improve your flexibility and balance while building strength and lowering your stress level, all from the tranquility and beauty of Amos Herr Park. Participants are asked to bring their own mat or towel and water. On June 9, July 14 and August 11, the classes and times remain the same but the setting changes as we move to Silver Spring Park in West Hempfield Township for more fun and exercise in the sun. On Thursday evening, June 21, Hempfield recCenter invites you to Grubb Lake in West Hempfield Township for a Family Scavenger Hunt with Nature Trivia. Families will be given a list of items to track down throughout the area. Found “treasures” will be displayed and discussed before taking part in some nature trivia. A second round of trivia and scavenger hunt will be held on Thursday, July 26 at Amos Herr Park in East Hempfield Township. Both events are free, beginning at 7:00 pm, and include a moderate amount of walking. Participants are asked to bring collection containers. Discover our beautiful parks and connect with neighbors and friends during the new Amos Herr Park Walk for Wellness. Beginning June 5 and running every Tuesday and Thursday at 9:15 am through August 28, you decide the pace and distance as you strut the park’s popular walking trails. The park classes are new to this year’s slate of activities presented by the nonprofit organization and are aimed at strengthening individual’s, families’ and children’s appreciation of wellness along with promoting a sense of community belonging. 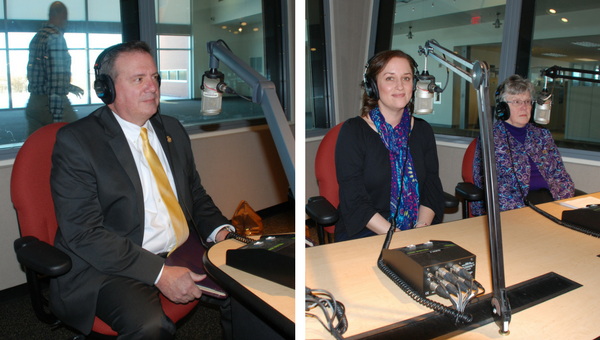 They join a number of classes and programs designed for the summer season. For more information on any program, please call 717-898-3102 or visit hempfieldrec.com. Hempfield recCenter is a nonprofit organization that promotes its Everyone Belongs campaign, a financial assistance program available to qualifying individuals, families and children in the Hempfield area ensuring everyone in the community has access to the quality programs it has to offer—because at Hempfield recCenter, everyone belongs! Hempfield recCenter announces their Summer 2018 summer sports camps. CLICK HERE for details. 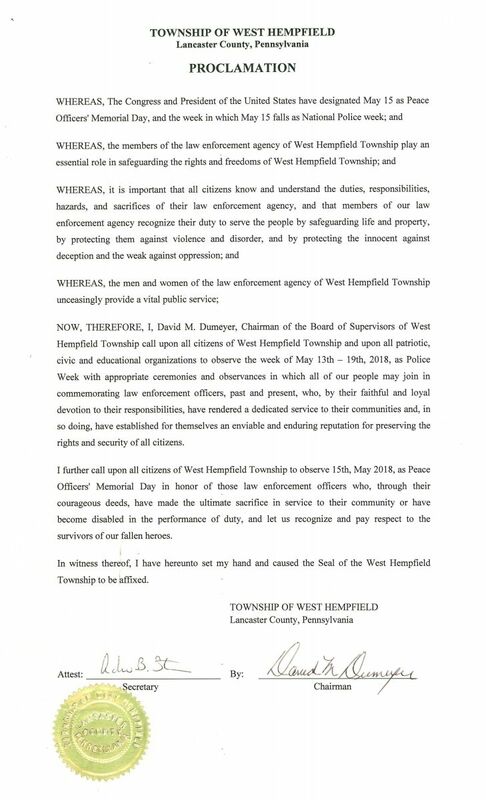 May 1, 2018: The West Hempfield Township Board of Supervisors adopted a Proclamation calling upon all citizens of West Hempfield Township and upon all patriotic, civic, and educational organizations to observe the week of May 13-19, 2018 at Police Week and to further observe May 15, 2018, as Peace Officers' Memorial Day. May 1, 2018: Each year the West Hempfield Township Board of Supervisors recognizes members of our police department and/or citizens in our community for actions that they had taken during the previous year that are believed to have been above what is expected of them and in some instances, have helped save or prolong a life of another individual. 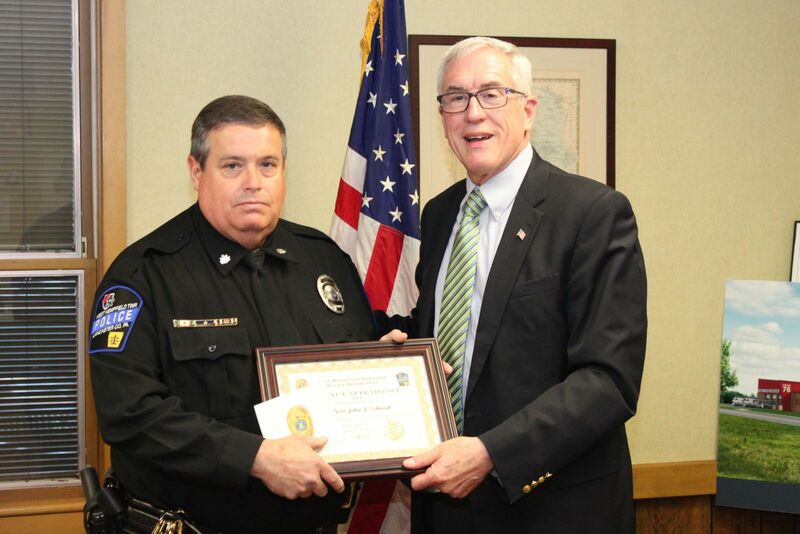 On May 1st at the Board’s regularly scheduled monthly meeting, the Board recognized several officers for their actions or commitment of service to the communities of West Hempfield Township and Mountville Borough. They also recognized two officers whose dedication to assist others with debilitating diseases by organizing an annual fundraiser. Additionally, the Board further recognized a service organization and a local business for their support of our police department by way of making monetary donations for equipment. 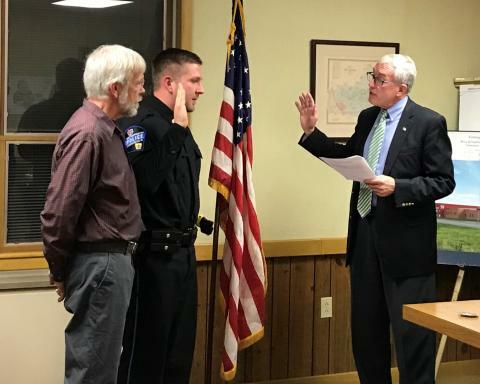 WEST HEMPFIELD TOWNSHIP, Lancaster County — The West Hempfield Township Police Department welcomed a new officer to the force on Dec. 5. 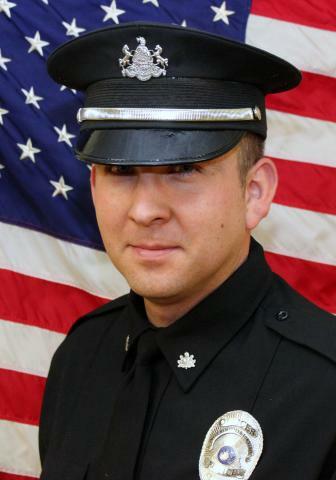 Officer Gabe Rimolo, a Union, NJ native who spent several years living in York County, is a veteran of both the Elkton and Baltimore City Police Departments. A graduate of the Baltimore City Police Department Training Academy, Rimolo recently moved back to Pennsylvania. 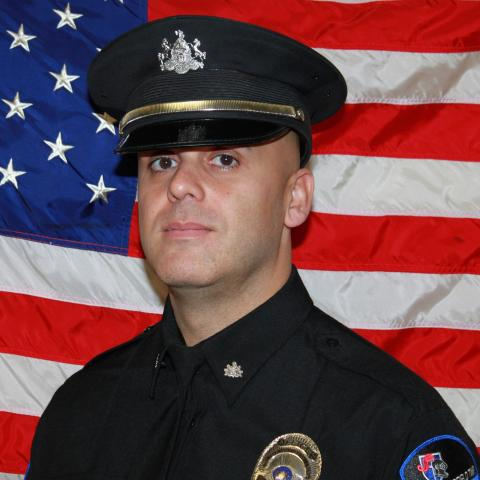 Rimolo will serve as a patrolman with the West Hempfield Township Police Department. He was joined by his wife and son at his swearing-in ceremony. Following the administering of the oath of office, Mrs. Rimolo pinned Officer Rimolo’s badge on his uniform. Each year the West Hempfield Township Board of Supervisors recognizes members of our police department and/or citizens in our community for actions that they had taken during the previous year that are believed to have been above what is expected of them and in some instances, have helped save or prolong a life of another individual. At the Board’s regularly scheduled meeting on May 2, 2017, they recognized one citizen and three officers for their actions that saved the life of another township resident. Also recognized were two officers who had perfect attendance in 2016. Lastly, they recognized a service organization, a local business, and a high school student honor society for their support of our police department by way of making monetary donations for equipment and the funding of community outreach programs. Last evening, Cpl Doug Ober, along with several officers from Susquehanna Regional Police Department, were recognized during the Police Commission meeting for their response to a suicidal person call on January 12th of this year. Each of the officers received the Meritorious Conduct Award from Chief E. Haugh of the Susquehanna Regional Police Department. Congratulations to Cpl Ober, WHPD and Lt Englert, Sgt Smith, Ofc Kauffman & Ofc Rodriguez of SRPD as well as all the officers who received recognition at last night’s ceremony. 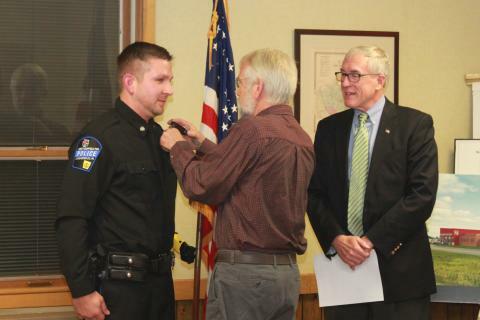 Congratulations Cpl Ober and thank you for proudly representing West Hempfield Township! Important information for Lancaster County residents regarding requirements to file a local earned income & net profits tx return by April 18, 2017. Leaf Collection - Woody Waste Info.